3. Protect the natural environment which is critical to the health of Florida's people, wildlife and economy. The Campaign launches with a website and Facebook Page to reach out to Floridians of all stripes; individuals, businesses, organizations, and elected officials are asked to sign the declaration. 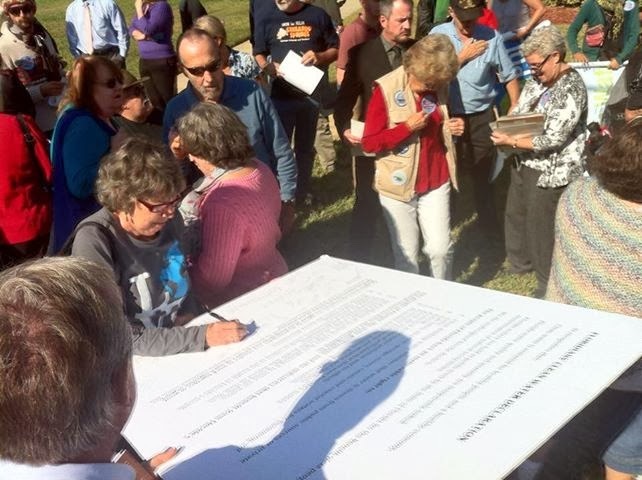 The activists were joined by FL Representative Linda Stewart (Orlando) who signed the declaration along with the 50 others at the announcement. 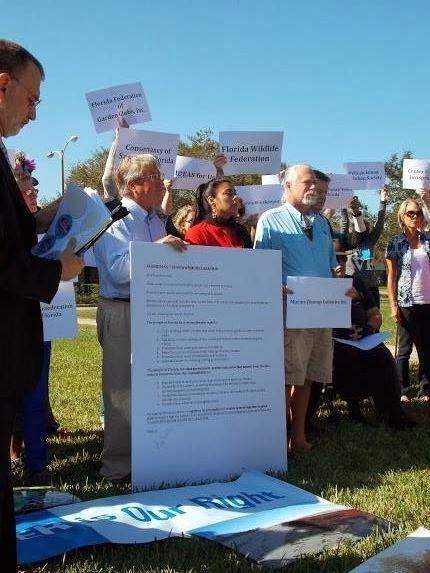 The crowd displayed signs representing the participating organizations, photos of an array of slime-choked waterways all over the state, banners reading “Stop Pollution at its Source” and “I signed the Floridians’ Clean Water Declaration” stickers. The declaration campaign is the result of the Citizens’ Clean Water Summit held last November 16 where 253 activists representing 121 organizations and businesses came together to find a way to work together more closely. 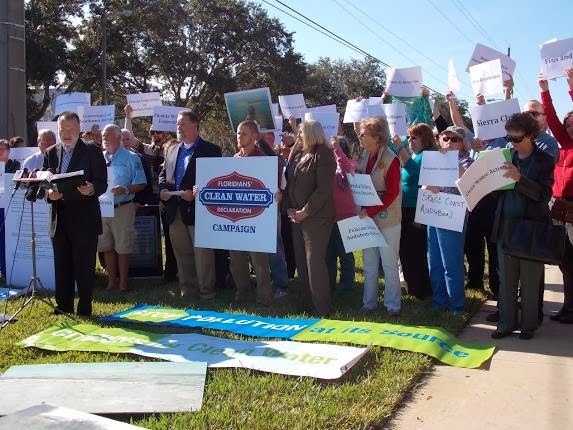 A collaborative planning committee of 19 organizations drafted the declaration to reflect the state’s clean water advocates’ collective “bottom line” for protecting Florida’s waters, wildlife and the health and livelihoods of the people who depend on them. "The sad fact is that Florida's polluters don't see clean water as their responsibility, and our State Government lets them get away with it. Florida needs to use the Clean Water Act to stop pollution at its source, instead of waiting for toxic algae blooms to grow so large that they kill our rivers, lakes and coastal estuaries. If Rick Scott's DEP were to embrace and follow the principles in the Citizens Clean Water Declaration, it would save taxpayers millions of dollars spent now to clean up red tide and green slime when it becomes a crisis." said Frank Jackalone, Sierra Club Senior Staff Manager. The event was covered by the Orlando Sentinel, Univision, News 96.5, NPR affiliates, and The Ledger. NAPLES, Fla. (12/11/13) –Conservation groups, including Conservancy of Southwest Florida, the Center for Biological Diversity Group and the Sierra Club, filed a lawsuit against the U.S. Army Corps of Engineers and U.S. Fish and Wildlife Service today seeking to halt a 970-acre limerock and sand mine in Collier County. The Hogan Island Quarry would be adjacent to the Camp Keais Strand, a significant wetland flowway that feeds downstream public wetland preserves and is a major wildlife corridor. Building the mine would have significant impacts on the Florida panther, wood stork, crested caracara, and eastern indigo snake.